How do I make an image look pixelated, like old school arcade graphics? 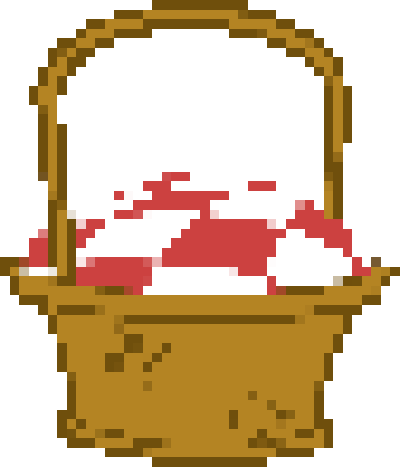 I want to take some stock art (can be of any dimension) and make it look pixelated, kind of like old Mario Brothers video games circa the 80's. Part of the image manipulation would require scaling down. This is what I'm starting with. Is there a filter or some Photoshop steps that I can use to make this effect? I tried essentially using the "Pixelate" filter but that creates transitions pixels between color edges. 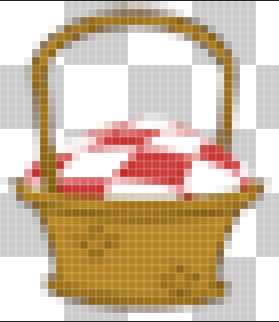 I also just tried to reduce the size of the image to 40 x 35 pixels and this is what I see. 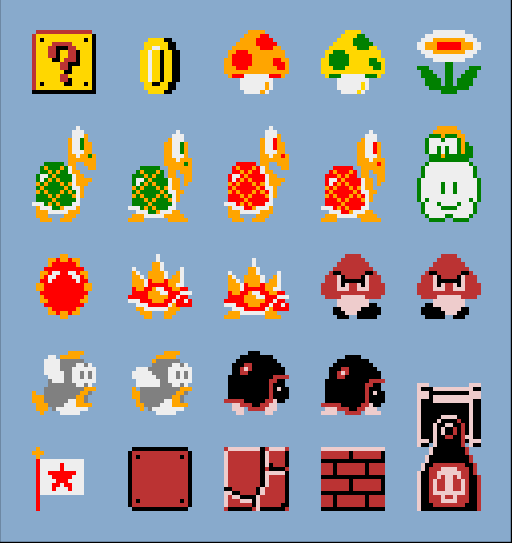 How do I get the crisp, full color pixels like the Mario Brothers icons. Here is a somewhat easy method to convert full size images to pixel graphics. To begin, go to Image -> Image Size. Change the Resample method to Nearest Neighbor, this will keep the hard edges. You can zoom into the preview on the left to get a good idea of what your end result will look like. You can see I'm at 500% in this example. Next set the width / height to your preferred size and hit OK.
Go back to image size and increase the size of your image to your required specs. 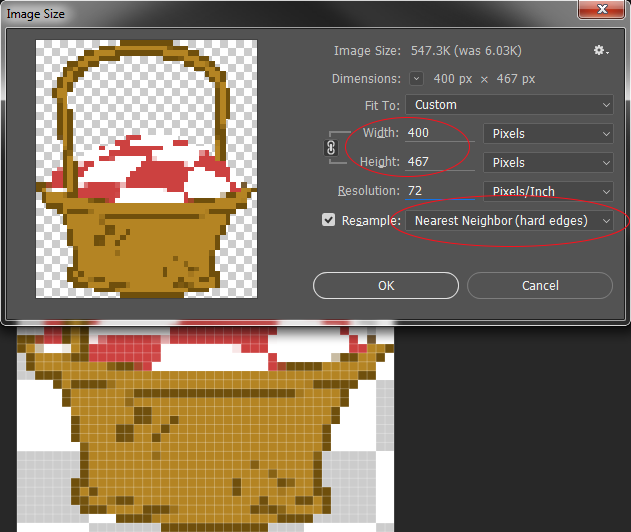 Make sure to keep Nearest Neighbor on. Press OK when done. When you are working with so few pixels you have to make every pixel count. I doubt an automated scaler will achieve that with satisfactory quality. My advice would be to downscale to the size required as normal (or possibly using a nearest-neighbour option), then zoom in, turn on the grid and go over your image pixel by pixel cleaning it up. To enhance the retro look you should also work with a limited palette of strong colors. Before starting, look at the original graphics you're trying to emulate. You'll see the areas of colour are flat and bright because the shapes themselves - believe it or not! - are straight edged areas. The only time you get the pixellating effect is when the lines are slightly off-straight, sloping. Then look at the picture. You'll see where the basket is SLIGHTLY pixellated. That's where you want to accentuate the effect. You do that by zooming in big (CTRL-Page Down or use View/Zoom from the menu)and using the eraser tool on smallest square mode (there's a list of squares on the left-hand side of the screen) to just take out an extra pixel here and there where the lines are vaguely pixellated already. You won't need to take out any pixels where the lines are vertical or horizontal because, if you look, you'll see there aren't any pixels missing from straight lines in the originals. You will need to nick one pixel from each corner of the square front of the basket. That's method 1. Method 2 starts off the same (using Paint, pasting in picture) but then just saving the picture in a really bad format. 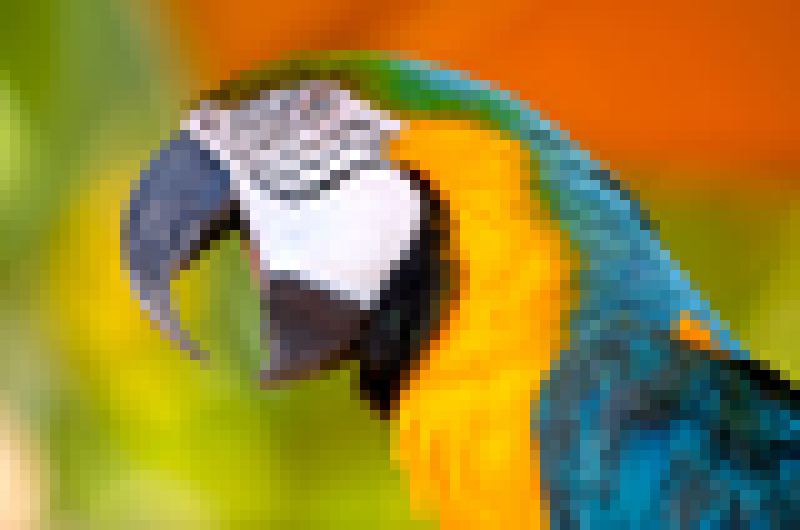 The plobrem with Method 2 is EVERYTHING will look blurry and pixellated. Don't forget, why Mario works is because the uprights and colours are flat and good, it's just non-straight lines and corners. If I was doing it, I'd go with Method One. Because I just DID and it worked! I'm even happy to send you my version if anyone can tell me a way of doing it. I would use imagemagick, a free, open source command-line tool available for MacOS, Windows and of course Linux. Just download, install and use the command line in a terminal. With a little experimentation, you can vary the pixel sizes. Of course, as with all of the other answers, your mileage will vary with the art and it is a good idea to go back and fix them up by hand. FYI, without the time to download and install imagemagick, I was able to execute the pixelation in less than 5 seconds. A simple bash script could then run through a whole folder and do this as a batch without the whole nightmare of pointy clicks. Not the answer you're looking for? Browse other questions tagged resize image-quality pixel-art or ask your own question. 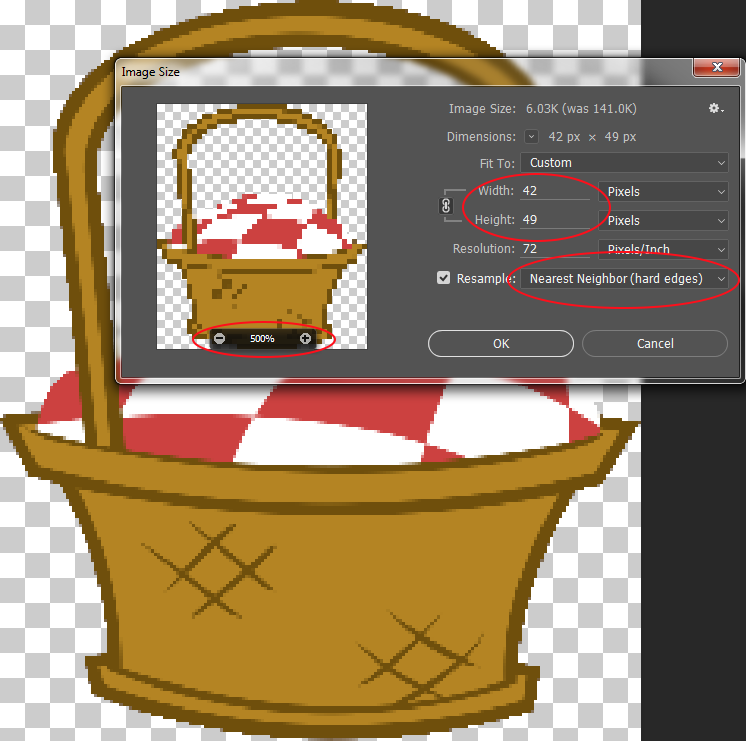 How to convert every pixel of raster picture to square objects in Illustrator? How do I make a good quality drawing look like a low quality screenshot from 90's TV in PS? How do I make my logo smaller without being blurry? Is there a way to make an image larger without losing quality? 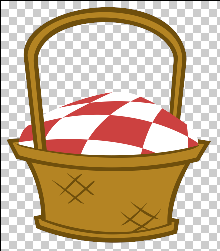 What program should I use to draw pixelated retro-style graphics? How do I create this pixel effect look in Photoshop? How to create a pixelated gradient outline? How do you make top down tileable mountain ranges like fire emblem?